The UK produces about three-quarters of the home-grown food that it consumes. About 70 per cent of its food imports come from the EU and 60 per cent of its food exports go to the EU. Although agriculture accounts for only 0.6 per cent of Britain’s economic product (gross value added) and 1.5 per cent of its workforce (476,000 people on 212,000 farms, of which some 41,000 exceed 100 hectares) about three-quarters of Britain’s land area is farmed, and agriculture has a major impact on the environment and the rural economy. It supplies the food and drink industry, a major manufacturing sector in the UK, which has 7,000 companies employing about 400,000 people.2 Under the devolution settlement, domestic agricultural policy is fully devolved to Scotland, Wales and Northern Ireland. the balance between food production and the environment. The Government has not yet given any coherent indication of its plans. The Ministers responsible are Andrea Leadsom (Secretary of State for Environment, Food and Rural Affairs) and George Eustice (Minister of State for Agriculture and Fisheries), who were both active supporters of the Leave campaign. In the Annex is a selection of policy statements made by them before and since the referendum. This paper focuses on the questions pertinent to the UK’s negotiations on future relations with the EU-27 and other international partners – that is, questions mainly in the field of trade. It does not attempt to offer a comprehensive blue-print for Britain’s domestic policy for agriculture and food. That debate has only just begun, with farmers’ representatives demanding that existing levels of agricultural support be maintained, with a ‘level playing field’ in competition with agricultural producers elsewhere, and that EU workers should continue to be employed on British farms, particularly for seasonal work.8 Meanwhile other interest groups are demanding that subsidies paid to farmers should be linked more closely to the protection of the environment, and that support for larger and more efficient farmers should be reduced.9 These differing and sometimes contradictory priorities, linked to the question of the level of import protection, form the background for a vigorous political debate in the coming years. Ireland is particularly dependent on agricultural trade with the UK: it imports 61 per cent of its intra-EU imports from the UK (53 per cent of its total agriculture and food products imports), while the UK takes 59 per cent of Ireland’s agriculture and food exports to the EU (44 per cent of its total agriculture and food exports).19 Coupled with the fact that Ireland is the only EU state that has a land border with the UK, this means that the Irish dimension will be particularly prominent in Britain’s agricultural trade arrangements with the EU. We do not know what policy the present Government may adopt. 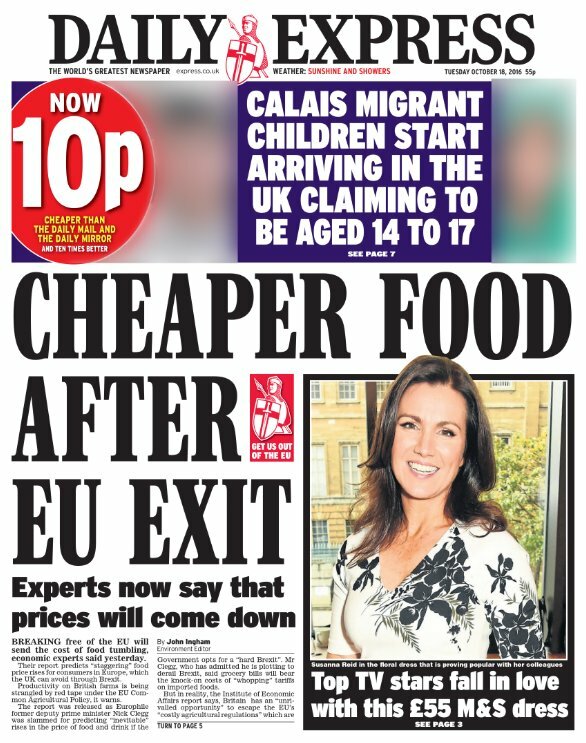 During the EU referendum, the Leave campaign relied on the arguments of economic experts such as Patrick Minford and Gerard Lyons who claimed that Brexit would lead to lower food prices as a result of freer trade in agriculture.21 Since the referendum the Daily Express, for example, has continued to pursue this line of argument with front-page headlines to match.22] It cited a report by the Institute of Economic Affairs saying that Brexit would let the UK avoid the EU’s “costly agricultural regulations” and “quitting the EU would make it easier for Britain to buy food from all around the world and bring down our prices more”.23 But it is not likely that the British Government will apply these ‘free trade’ ideas. The most probable outcome is a continuation of import protection at approximately the same levels as at present under the CAP, with some possible exceptions, for example, in the case of sugar. In examining the possible options for Britain’s agricultural trade with the EU-27, we need to consider first the wider question whether the UK would remain within the EU’s customs union, which would mean applying the same tariffs and charges as the EU on imports from the rest of the world. It should be remembered that Norway and other European Free Trade Association members of the European Economic Area do not apply the CAP and are not in the EU’s customs union. If the UK is not in the customs union, an important consequence follows: customs controls will apply at its borders with the EU, not only at its land frontier in Ireland but also on cross-Channel routes to France and other EU states. Although simplified procedures may be agreed, British exports to the EU, and EU exports to Britain, would be subject to paperwork not presently required, which will add to the transaction costs of agricultural trade in both directions. Checks on the origin of traded products, which would be required under any trade agreement with the EU, would add further costs. Trade with the EU on the basis of WTO rules, without such an agreement. the risk that regulatory divergence, such as a relaxation of British rules on pesticides or genetically modified crops, could have a similar effect. To agree mutually satisfactory provisions on these matters, with regulatory supervision and dispute-settlement procedures, would not be easy. Under WTO rules the UK could impose non-tariff restrictions on agricultural imports only on grounds of food safety, not for environmental reasons or because of lower animal welfare standards. It would be free to apply tariffs, subject to WTO approval. If it did so at current (EU) levels, applying them newly to imports from the EU (as it must under WTO rules), this would result in consumer price rises. In both the above scenarios, British producers wishing to export agricultural produce to the EU would have to continue to meet all EU regulations, standards and labelling for such exports. For meat and livestock, EU hygiene rules are particularly demanding: this would mean that British slaughterhouses would have to be inspected and it is possible that British exports would have to go through Border Inspection Posts. In general, unless the UK decided to maintain the same EU standards, British producers would need to decide whether to apply EU standards to all their production, or to work with different standards and labelling for home markets and for exports. In cases such as fresh produce, differentiation is costly, so processors often apply the highest standards for all their throughput. It should be noted that Norway and Switzerland apply EU product standards and regulations to all their domestic agricultural production, despite not having free trade for these products with the EU. Agriculture (though not agricultural trade) is among the policies wholly devolved to the Scottish, Welsh, and Northern Irish administrations. So the challenge is not simply to develop a new national policy, but four new policies for the four nations of the UK. Future UK policy on agricultural trade may also lead to regional complications. The British beef market will be attractive for the United States and South American countries, but the impact of granting access to the beef market would be felt mostly in the North and West of the UK. Outside the EU, Britain would need to introduce a new national policy for agriculture and food in place of the Common Agricultural Policy. Developing a new agricultural policy requires determining (among other things) a choice between the priorities of agriculture and the environment, the mechanisms of support for farmers, the level of public expenditure, and trade policy for agriculture (tariffs charged on imports, tariffs faced by exports). These factors are interrelated, and solutions will be complicated since agricultural policy (though not trade) is fully devolved to the four nations of the UK. So far, the Government has given no clear indication of future policy, either for domestic agricultural arrangements or for external trade. Although the Leave campaign used the argument that food prices would be reduced because the UK would introduce free trade for agriculture with the rest of the world, this seems unlikely. At present British farmers are dependent on EU subsidies for 55 per cent of their incomes; the Government has promised to guarantee the current level of agricultural funding until 2020, and subsequently it will not want to face demands for further compensation for farm losses due to lower prices. In the absence of a new trade agreement with the EU, the UK would operate under WTO rules. If it took on the existing EU tariff rates (as would be likely), this would increase the cost of imports to the U.K. and result in higher food prices. This would be in addition to price increases resulting from the fall in sterling since the vote to leave. The British food industry is heavily dependent on exports to the rest of the EU, which accounts for 62 per cent of UK agriculture and food products exports. Since EU external tariffs on some products, particularly meat and dairy, are high, the optimal solution would be a bilateral agreement for free trade between the UK and the EU in all or most agriculture and food products. But this could be accompanied by a concern on the EU side that UK agricultural trade with third countries should not disturb European markets by lowering British prices. Both sides would wish to avoid distortion of competition through changes in domestic agricultural subsidies, and this could require regulatory supervision and dispute-settlement procedures. Similar questions would arise over the question of regulatory divergence, such as a relaxation of British rules on pesticides. In all cases, British producers wishing to export agricultural produce to the EU would have to meet all EU regulations, standards and labelling for such exports. For meat, for example, this would mean inspection of British slaughterhouses. Finally, agricultural trade across the border with Ireland – which is important in both directions – would be a particularly sensitive question. With the UK outside the EU’s customs union, controls on goods passing between Northern Ireland and the South would be necessary, and although it may be possible to devise simplified border controls for goods passing by road – for example, by equipping lorries with electronic tags – it will be very difficult to control effectively 500 kilometres of largely unmarked border, particularly for the passage of live animals or other agricultural products.